1 Sunfuny 3 Mode Smart 3D Pen = 1 PLA High Temperature 3D Pen + 1 PCL Low Temperature 3D Pen + 1 ABS 3D Pen! A great combination of high temperature and low temperature 3d pen! Advanced technology make the 3d pen funny and intelligent. Just start your smart and colorful creating! Freely switch PLA/PCL/ABS mode, 1-100 digital speed control and one-button flow control, control everything in your hands. Auto memory, 2 minutes auto unloading and sleep function ensure convenience and safety. Light weight and polished metal handle provide comfortable feeling for hours of entertainment. Everything You Need In One Great Value Package! √THREE MODE & STEPLESS SPEED - Our innovative 3d printing pen is compatible with PCL/PLA/ABS. The 3d doodler pen can easily switch low or high temperature mode. 1-100 stepless speed control makes 3d pen easier to control the slower detail work or faster infill work. √INTELLIGENT & SAFE - ONE-BUTTON operation easily control the continuous drawing and pause. Real-time LCD display, quieter motor and antiskid button provide a fantastic 3d doodling experience for you. 3 heat dissipations and auto sleep function ensure safety. 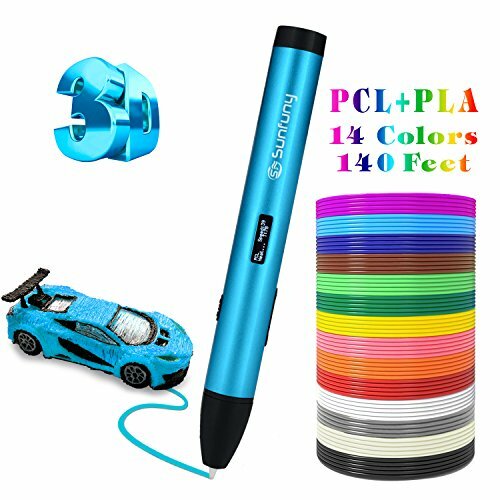 √GREAT VALUE PACK - We bonus abundant 3d accessories set: 140 feet, 10 feet each filament refills (12 different color PLA + 2 color PCL), 3d DIY craft removal tool, portable case, PVC drawing board, 3d drawing stencil. No need to buy extra 3d pen kit! We also offer e-books stencil, if you need, please contact us by email. √AMAZING GIFT FOR ALL AGES - Sunfuny 3d craft pen is a great gift for kids and adults to create anything in reality. It is a perfect 3d pen for kids to develop their spatial thinking, spend quality time with parents at holiday! ▲100% MONEY BACK - Sunfuny provide 30-day money back or exchange guarantee and lifetime aftersales service for all Sunfuny 3D drawing pens. If anytime product breakage or unsatisfied experience, please feel free to contact us. No worry to have a try. If you have any questions about this product by Sunfuny, contact us by completing and submitting the form below. If you are looking for a specif part number, please include it with your message.